Armando ReverÃ³n, with foreword by Glenn D. Lowry and text by John Elderfield and Luis Pérez-Oramas (New York, Museum of Modern Art, dist. by DAP, $45.00 hardback) is the first major volume on the work of the celebrated Latin American artist, Armando ReverÃ³n to be published in English. His retrospective was exhibited at MOMA, New York in the spring of 2007, introducing the Latin American artist to an international audience. Well known in his native Venezuela (1899-1954), but little known outside Latin America, ReverÃ³n deserves to be ranked alongside the great early European modernists. He studied art in his native Venezuela, and then in Spain, where he discovered the work of Francisco Goya and one of his instructors was José Ruiz Blasco, the father of Pablo Picasso. Back in Venezuela, he participated in the CÃ­rculo de Bellas Artes, a group of young artists seeking to develop a specifically national modernism, only to move in 1921 to the coastal town of Macuto, where, over a number of years, he built a complex called El Castillete (The Little Castle). By the mid-1920s, he had fused Post-Impressionist idioms with an extremely tactile surface and a bleached, subdued monochromatic palette, creating his most widely celebrated, radical paintings. In the 1930s he turned to making mysterious sepia-toned figure compositions, supposedly of indigenous subjects, but by the end of the decade he was using as models the uncanny life-size dolls that he made with his companion, Juanita RÃ­os. Along with a wide variety of imitation household objects. This is the most mysterious, haunting, period of his life. Then in the 1940s he turned again to landscape painting, concentrating again on figural works, and finally on a series of extraordinary self-portraits surrounded by dolls. He spent the rest of his life in the seclusion of El Castillete, yet as his fame grew he was increasingly visited by photographers and filmmakers who shaped his image as a new Robinson Crusoe in the Caribbean. This is an extraordinary exhibition catalog of an extraordinary artist. His biographical statement done in 1949 is published herein, as well as more than 100 pieces in the show, an interview with the artist, a bibliographical notes, and index which concludes the publication, plus 164 color and 41 black and white illustrations. This exhibition and its catalog will put this artist among the important Latin American 20th century artists. The Busch-Reisinger Museum, edited by Peter Nisbet with an essay by Joseph Leo Koerner (Cambridge, MA, Harvard University Art Museums in assoc. with Scala Publishers, London, 2007, $65.00 hardcover) is the only museum in America devoted to promoting the arts of Central and Northern Europe, with a special emphasis on the German-speaking countries in all periods. Founded in 1901 as the Germanic Museum, the museum relocated in 1991 to the new Werner Otto Hall, a building adjacent to and accessible through the Fogg Art Museum. It originally contained only reproductions, notably plaster casts of major Germanic sculptural and architectural monuments. Then under the curatorship (1930-1968) of Charles L. Kuhn, the Museum developed into one of the leading collections of modern art from Germany, Austria, Switzerland, and related cultures. The Museum was renamed the Busch-Reisinger Msueum in 1950 in honor of the related St. Louis families who had contributed decisively to its support. Strong in Austrian Secession art (Klimt, Schiele, Hoffmann), Germany expressionism (Kirchner, Nolde, Kandinsky), 1920s abstraction (El Lissitzky), and material related to the Bauhaus (including archives of Lyonel Feininger and Walter Gropius), the museum also has notable collections of late Medieval, Renaissance, and Baroque sculpture, 16th-century painting, and 18th-century porcelain, and recently on postwar and contemporary art from German-speaking Europe, including works by Gerhard Richter, Sigmar Polke, and many others. Their collection of Joseph Beuys is among the world’s most comprehensive. With 233 color, 24 b/w illustrations, this is a brilliantly illustrated book for the first time of this monumental museum, with a timeline, index and two provocative essays and recommended for all art history collections, historical and contemporary. Vancouver Art & Economies, edited by Melanie O’Brian is a co-publication of Arsenal Pulp Press & Artspeak, Vancouver, 2007, $24.95 US paperback, dist. By Consortium Book Sales) shows how the once marginal city of Vancouver has developed within a globalized economy since the mid-1980s, and become an internationally recognized center for contemporary visual art. Its status is due not only to a thriving worldwide cultural community that has turned to examine the so-called periphery, but to the city’s growth, its artists, expanding institutions, and a strong history of introspection and critical assessment. Today Vancouver is visible and often understood as distinct. This volume offers nine essays to address the organized systems that have affected contemporary art in Vancouver and made it distinct over the last two decades. This forum for critical dialogue includes Vancouver writers, artists, and/or curators Clint Burnham, Randy Lele Cutler, Tim Lee, Sadira Rodrigues, Marina Roy, Sharla Sava, Reid Shier, Shepherd Steiner, and Michael Turner, and includes color and black-and-white images throughout. Titles such as “Adventures in Reading Landscape” (Marina Rouy) or” In Another Orbit Altogether: Jeff Wall in 1996 and 1997” (Shepherd Steiner) or “Do Artists Need Artist-Run Centres?” by Reid Shier give you an indication of the wide-ranging discussion. This anthology intends to complicate the notion of definability, since Vancouver has had a history of historical, critical, and political engagement; its sites of cultural production; and its theoretical and practical intersection with technology or policy. This is a very good case study. Notes, Gallery chronology, index. Cautionary Tales: Critical Curating, edited by Steven Rand and Heather Kouris with contributions by Sara Arrhenius, David Carrier, Boris Groys, Kate Fowle, Dave Hickey, Geeta Kapur, Young Chul Lee, David Levi Strauss, Jean-Hubert Martin, and AndrÃ¡s SzÃ¡ntÃ³ (New York, apexart, 2007, order from apexart, 291 Church St., NYC 10013, $10.95 paper - info@apexart.org) includes ten international art-related professionals who consider the increased influence of independent curators and cultural producers and how the role of the “curator” has changed over the last 10 years. Using examples from past exhibitions and personal experiences, the writers address how working within an institution differs from being independent, the difficulties of balancing artistic vision with expectations of funders and institutions, and the ethical issues of working with artists and collectiors, among other subjects. This is a resource text for students and others interested in the curatorial field. The Universitas Project: Solutions for a Post-Technological Society, conceived and directed by Emilio Ambasz (New York, Museum of Modern Art, 2007, $34.94 paper) with essays by Jean Baudrillard, Manuel Castells, Gillo Dorfles, Ronald Dworkin, Umberto Eco, Erich Jantsch, Suzanne Keller, Gyorgy Kepes, Richard L. Meier, Martin Pawley, Octavio Paz, et al. This Universitas Project was hosted by the Museum of Modern Art in January of 1972, as a two-day conference sponsored by the Museum’s International Council and the Institute for Architecture and Urban In addition, Hannah Arendt, Kenneth Frampton, Edward L. Logue, Meyer Schapiro, Carl Schorske, Denise Scott Brown and Jivan Tabibian, among many others, engaged in a multidisciplinary debate on the future of design and design institutions in the post-industrial era. This ambitious symposium was conceived and directed by the architect and designer Emilio Ambasz, then Curator of Design at the Museum, that proposed a critical inquiry into the relation of man to the natural and sociocultural environment. It questioned the adequacy of prevailing modes of thought and existing institutions in dealing with the increasingly complex problems of the man-made environment, and examined the idea of founding an experimental university to develop modes of thought and action that would be better suited to dealing with those problems. After more than three decades of being housed in the Museum Archives, the symposium and its affiliated texts have now been assumed in this publication, which presents one of the most extensive and stimulating engagements between architecture and other theoretical and technological disciplines ever conducted at the Museum, or indeed, anywhere else. Unlike today, the multidisciplinary nature of this architectural event was unprecedented in the Museum’s history, and the list of participants forms a truly remarkably array of some of the best and most noted minds of the latter half of the 20th century. Yet the issues they discussed have resonance today no less that they did when originally articulated at the Museum’s 1972 gathering. The volume includes all the initial documents prepared by Ambasz and his team at the Museum, some 20 individual scholarly papers, the complete proceedings of the four sessions recorded during the two-day symposium, and a group of postscripts submitted by eleven of the participants after the event. This is now available for the first time to scholars, the architecture and design community, and the general public. Biographies, Index. Distributed by D.A.P. Feminists Who Changed America 1963-1975, edited by Barbara J. Love with a Foreword by Nancy F. Cott (Urbana, University of Illinois Press, 2006 (626 pp., 45 photographs (black and white), $80.00 hardbound) documents key feminists who ignited the second wave of the movement. This is the first comprehensive directory to document many of the founders and leaders (including both well-known and grassroots organizers) of the second wave of the women’s movement It tells the stories of more than two thousand individual women and a few notable men who ignited the women’s movement and made permanent changes to entrenched customs and laws. The biographical entries on these pioneering feminists represent their many factions, all parts of the country, all races and ethnic groups, and all political ideologies. Nancy F. Cott’s foreword discusses the movement in relation to the earlier first wave and presents a brief overview of the second wave in the context of other contemporaneous social movements. This is definitely recommended for all reference collections, since it includes biographies never before found in reference literature. It adds another chapter to the history of the feminist movement with pride. The Archive, edited by Charles Merewether (Cambridge,, MIT Press, 2007, $22.95 paperback) is another in the series of Documents of Contemporary Art. Among art’s most significant developments worldwide since the 1960s has been a turn to the archive–the nexus of images, objects, documents and traces through which we recall and revisit individual and shared memories and histories. This anthology of key writings by influential artists and theorists explores ways in which the archive has become central in visual culture’s investigations of history, memory, testimony and identity. The 20th century saw how history was rewritten, camouflaged, buried, destroyed, and literally transformed with Holocaust denial, media disinformation, third-world consciousness. Here we have the work of Marc Dion, David Wilson’s Museum of Jurassic Technology, Kurt Schwitters’ Merzbau, and work by The Atlas Group, Walter Benjamin, Christian Boltanski, Broodthaers, Michel Foucault, Sigmund Freud, Allan Sekula, Margarita Tupitsyn, Andy Warhol, and many more. Walter Benjamin reminds us that the archive is a byproduct of modernism, born from the spirit of bureaucracy. Without bureaucracy, there would be no train tickets or card catalogs to save. Without bureaucracy, there would be no modern art. Biographical notes, bibliography, index. A Place in the Sun: Photographs of Los Angeles by John Humble, with essays by Gordon Baldwin (Los Angles, J. Paul Getty Museum, 2007, $39.95 hardcover) is a celebration of Humble’s distinctive view of Los Angeles–from the concrete channels of the Los Angeles River to the recognizable cityscape through which that river winds. Having lived in Los Angeles for more than 30 years, Humble has created a body of work that captures the unique architecture and natural environment of Southern California. In a strange way, Humble has been a poet with his camera, capturing “the incongruities and ironies of the Los Angeles landscape” which includes sadness and decay, as well as that eternal balmy place in the sun. Divided into two sections, the photographs are “An Essential Humanity” which includes urban views, while “The Voice of the River” includes a series of shots of the Los Angeles River. In this oversize volume, the images are large and include the freeways and later, the roadways at night; impromptu portraits of a variety of Angelenos, including construction teams, gang members, a wedding group on a downtown sidewalk and so much more. He has a 4 x 5 camera and shoots in his own vocabulary, with his own eye–making a distinctive body of work. Humble sees the ironic juxtapositions of a home and an electric system behind it, or an auto leasing lot and billboards advertising Las Vegas; and so much more in these 40 large prints. He also has an afterword and technical notes. You learn the artist’s documentation. An outstanding book for all contemporary art collections. Spectacular City: Photographing the Future, edited by Emiliano Gandolfi with text by Steven Jacobs, Jean-Francois Chevrier (Rotterdam, NAI, 2006, $59.95 hardcover) is a collection of lyrical, large-format photographs portraying beauty and the potential of urban landscapes, iconic buildings and deserted interiors. With manipulation, construction or reconstruction, photographers in their way are photographing the future. With some 100 photographs taken in the last 10 years by internationally acclaimed artists such as Andreas Gursky, Thomas Struth, Thoms Ruff and Olivo Barbieri, as well as by leading Dutch practitioners in their field such as Edwin Zwakman, Fran van der Salm and Bas Princen, the NAI unveils a new world in this survey. The images are of ports, industrial zones, neighborhoods once considered ugly now have a fresh visual appeal. The work is diverse, complex and versatile. Candida Höfer: Dresden (Cologne, Walther König Verlag, 2006, $36.00 paper) is a pocket-sized volume showcasing some of the most monumental recent work by the German photographer, Candida Höfer. It featurs 52 of the most important historical public institutions in the city of Dresden, including libraries, museums, archives and performing arts centers. The artist captures interior spaces in a grand manner, always devoid of people, but breathing with the breath of those who have occupied them. Her “monuments” are full of spirits and ghosts of the past, as well as the creators of those spaces leaving their footprints behind. Between the Lines: A Coloring Book of Drawings by Contemporary Artists is a project of RXArt, a non-profit organization that promotes healing through exposure to original fine art (Los Angeles, Modern Publishing, 2007, $17.00 paperback) reminds me of several artists’ coloring books that were “published” by artists in the 70s and early 80s, but this one is phenomenal because there is a collection of energetic line drawings by such artists as Vito Acconci, John Baldessari, R. Crumb, Keith Haring, Sol LeWitt, Robert Longo, Robert Mapplethorpe, Julian Opie, Laura Owens, Kenny Scharf, Andy Warhol, William Wegman, and many others. In the center are four pages of original stickers by Assume Vivid Astro Focus and Ryan McGinness, and.well, buy two–one to keep pristine, the other to color! With more than 80 self-portraits, Rembrandt often stole his own features and put them in other paintings and in his etchings. Since many of his sitters were the movers and shakers of Dutch aristocracy of the 1600s, it was not unusual to take the theatrical aspect of representing figures in space, even when they stand alone, isolated. In reading this book, one is convinced that Taylor feels Rembrandt mirrored a great deal of his wisdom regarding human nature from his subjects’ noses. Lots of reproductions (49 duotone) allow you to look secretly at all those noses to see if you agree or not with the author. But you’ll love this book for the sheer joy of seeing the illustrations of the thesis, and feeling you know something more than the “next guy” during Rembrandt’s 400th anniversary of his birth. Monochromes: From Malevich to the Present by Barbara Rose (Berkeley, Univ. of California Press, 2007, $34.95 paper) is the first comprehensive study of the modern history of monochrome art, tracing the development of single-color artwork–painting, sculpture, photography, video, and installations–up to the present. With almost 160 full-color reproductions, this stunning book examines fundamental aesthetic issues raised by the monochrome in a historical context. The question is posed by the authors whether monochrome is the last and most radical phase of abstract painting or instead a point of departure for installations and environments. Included in the book among many are Alexander Rodchenko, Georgia O’Keeffe, Lucio Fontana, Yves Klein, Ad Reinhardt, Frank Stella, Andy Warhol, Robert Irwin, and Isamu Noguchi. There are writings on the monochrome by 26 artists, including Malevich to Warhol, and from Carl Andre, Reinhardt, and Donald Judd to Ben Nicholson, Robert Ryman, and Anish Kapoor. In her engaging essay, Barbara Rose deftly surveys the divergent complex issues raised by the monochrome. The other authors are Gladys Fabre, Christopher K. Ho and Vincenzo Trione. Includes biographies, bibliography and index. Biblioteca/ Vasconcelos/ Library, edited by Miquel AdriÃ¡,with text by Miguel AdriÃ¡, Felipe Garrido, Marco Bassols and Pablo Frost, is the result of the Mexico’s first international architecture competition in more than a century–the first since the never-finished Legislative Palace project in 1896. This most important public works project of the decade in Mexico is introduced in this tour in color and black-and-white, detailing Gabriel Orozco’s work built into the site, and architect Alberto Kalach’s design in sketches, renderings and plans. Eugenio Carmi: Three Billion Zeros with text by Martina Carganati and Eugenio Carmi, as well as introduction by Furio Colombo (Milano, Charta dist. by DAP, 2006, 60.00 hardcover) has the zest and energy of this amazing artist, born in Genoa in 1920, calling himself a “manufacturer of images.” Others call him one of the most quietly significant forces in 20th century Italian art. He studied under Felice Casorati and worked his way up through the graphic art world, which still influences his fine art, made of rectangles, circles and lines in remarkable colors. He worked his way up through the graphic art world, which still influences his fine art. . From 1958 to 1965, he was responsible for Italsider’s corporate image; in 1966 he participated in the Venice Biennale; in 1973. He created a 25-minute experimental program–completely abstract–for the RAI television network. But perhaps he is best known for the illustrations he created for Umberto Eco’s stories, published alongside them in Italy and in many other countries. His geometric compositions and careful but confident use of color make him a bellwether of Italian taste. One of his inventions was a “Carm-o-matic”, built by Olivetti based on Carmi’s design in 1968. The work was displayed at the exhibition entitled Cybernetic Serendipity organized by the ICA in London. Subsequently, after being put into storage by Olivetti, it was destroyed with his knowledge. But when German critic Volker Feierabend visited his studio with Klaus Wolbert, President of the VAG Foundation of Frankfurt, they asked him if they could purchase the work for the Zentrum fur Kunst und Medientechnologie in Karlsruhe. His friend reconstructed the work from scratch and it is now part of the the museum’s collection. 180 illustrations, of which 150 are in color. This may be an introduction for readers, but Eugenio Carmi, a remarkable zestful artist, deserves to be known worldwide. Modern & Contemporary Art at the Virginia Museum of Fine Arts by John B. Ravenal (Richmond, Virginia Museum of Fine Arts, 2007, $19.50 hardbound) is a beautifully designed small book of 114 paintings, sculpture, video art, prints, drawings, photographs and collage in the collection of the Virginia Museum of Art. There are quotes of many of the contemporary artists, an artists’ index, and commentary by the author who has developed a remarkable collection at the museum. The range is from Jackson Pollock’s dynamic 1948 drip painting to Kehinde Wiley’s hip-hop portrait done in 2006. Robert Rauschenberg: Works, Writing, Interviews, with text by Sam Hunter (Barcelona, Ediciones Poligrafa, 2006, $45.00 hardbound, dist. by D.A.P.) fills out the understanding of this innovative and challenging artist who changed the course of art history in the 1950s, also redefining the very materials that art could be made of, rebelling against Abstract Expressionism of the time with the impeccable logic that, “I think a painting is more like the real world if it’s made out of th real world.” In pushing the boundaries of photography, film, and television as well as painting and art at large, he has definitely written the chapter of art history in the last half of the 20th century. From his Combines to his silkscreens, there are 125 color illustrations and 20 black and white. But this is not a picture book. It, in fact, an homage to a great artist with a writer who knows the artist and has watched him become who he is today. It is done with passion, with enthusiasm and with great erudition. And the bonus is a segment of writings by Rauschenberg, as well as an interview with Richard Kostelanetz and one with Alain Sayag, a biography and bibliography. Perhaps this is the best book to give anyone to understand Rauschenberg. Recommended for all contemporary collections. Jonathan Monk: Until Then….If Not Before, edited and with text by Frédéric Paul, with interviews and contributions by Pierre Bismuth, David Shrigley, Ed ruscha, Ceal Floyer, Claude Closky, and John Baldessari (Bretagne, Domaine de Kerguéhennec, 2007, $48.00 hardback, dist. by D.A.P.) portrays Jonathan Monk, born in the UK in 1969, a dry-humored mischief-maker who explores 190s influences in installations, photography, film, sculpture and performance. He has been quite successful having been in New Photography at MOMA in New York in 2006 and at the Tate Triennial. This book is bilingual (French and English) and includes an interview with David Shrigley where he says “it is sometimes difficult to understand where it [art] all begins and ends…the unanswerable question keeps us all going.” His work is just as quotable, including signs that read, “Meeting point” and “This painting should ideally be hung to the left of an Ed Ruscha.” Some of his influential supports are included in this volume as well. Marina Abramovic: Seven Easy Pieces with interview by Nancy Spector, text by Marina Abramovic, Erika Fischer-Lichte, Sandra Umathum (Milano, Charta, 2007, $59.95 paper) is the documentation of seven consecutive, groundbreaking nights o monumental, solo, body-art performances by the internationally renowned artist, Marina Abramovic, during the fall of 2005 in the famous rotunda of New York City’s Guggenheim Museum. Recreating 6 seminal works (by five other artists and herself) from the formative decade, 1965-1975, each night she re-enacted Vito Acconci’s Seebed (1972), Valie Export’s Action Pants: Genital Panic (1969), as well as her own Lips of Thomas (1975) in which the artist ate a kilogram of honey and drank a liter of red wine before breaking her glass with her hand, incising a star in her stomach with a razor blade, whipping herself until she “no longer felt pain,” then lying down on an ice cross while a space heater suspended above her caused her to bleed even more profusely. She also repeated Bruce Nauman’s Body Pressure, Gina Pane’s The Conditioning, and Joseph Beuys’s critical exploration, How to Explain Pictures of a Dead Hare. According to friends of mine who attended every one of the seven events, they cried with her at the end, the experience was so intense. She ended with a new piece which she created for this project. In this important series, Abramovic gives us the opportunity to recall, revive and preserve major historical performance pieces, all of which are inherently ephemeral, in a completely original way. She also amplifies her art and her reasons for doing it in a rich interview with Nancy Spector done in May 2006. Includes a series of conversations with people who saw the 7 events, Abramovic’s letter of agreement with the Guggenheim Museum, biography, selected solo and group exhibitions, and bibliography. She has demonstrated the power of performance by an artist whose great intelligence and beauty shine forth. Performa: New Visual Art Performance by RoseLee Goldberg with a foreword by Hal Foster (New York, Performa, 2007 dist. by D.A.P., $39.95 flexicover) is a catalog and historical record of the world’s first performance biennial, which took place in New York City in November 2005. Serving as an artists’ journal and reference tool, this book provides an international platform for the research, development, and presentation of new performance by visual artists from around the world. 200 artists are represented with photographs, sketches, storyboards, scripts, interviews, and essays. The book “performs” as a collective artists’ journal might. And without funding, this event was created by an advisory committee of artists and curators from Tokyo to Johannesburg, London, New York and Milano, and a consortium of New York art spaces (more than 20). 12 curators selected more than 100 artists. Besides totally immersive series of events, there were discussions of writing about performance and the multiple disciplines covered by the term. And Performa serves as a community of action and imagination. Artists biographies, calendar of events, index. Witness to Her Art: Art and Writings by Adrian Piper, Mona Hatoum, Cady Noland, Jenny Holzer, Kara Walker, Daniela Rossell and Eau de Cologne, edited by Rhea Anastas and Michael Brenson, includes writing by Adrian Piper, Kara Walker, Daniela Rossell, Mona Hatoum, Cady Noland, Jenny Holzer, Michael Brenson, Norton Batkin, Pamela Franks, David Levi Strauss, Cuauhtemoc Medina and Hamza Walker, among others. This book documents and explores unknown or little known artistic projects by six influential artists, as well as a pioneering magazine project, Eau de Cologne, (a magazine published by gallerist Monika Spruth) that was also a direct response to social and political realities that needed to be aesthetically engaged. The artworks are accompanied by original writings by the artists, as well as criticism and commissioned essays. The ambitious works presented and interpreted in this book invite us to consider the impact of the feminist revolution across generations while rendering obsolete any stigma associated with shows or catalogs limited to women artists. In fact, the intention is to show little-known works in order to radicalize the ways artists address their publics. The stimulus is a collection at the Center for Curatorial Studies at Bard College. A fascinating book which will probably change your outlook on these artists and on looking at artists in general and how they address their viewers. (Annandale-on-Hudson, NY, Bard College, 2006, dist. by D.A.P., $40.00 hardback) with 336 pages, 240 color illustrations, 76 black and white. Exquisitely printed, the full page works of art, some smaller includes 150 illustrations, 100 in color. Included are two CDs which record a conversation Lynch had with Kristine McKenna in Los Angeles in December 2006. The conversation is also excerpted in the book from the transcript of the conversation while they perused this book. A fascinating approach to a conversation as you the viewer also turn the pages. This book is revelatory, since it shows Lynch’s wide spectrum of formal experimentation. With the use of various paper types, clear organization, and high production, some of the images are not well reproduced, since they appear muddy and not well defined. Lynch’s brushstrokes seem to be washed out as well. But all in all, this is an important collection of a filmmaker who is truly an artist with interconnected intricacies in all of his media. Mel Bochner: Language 1966-2006 by Johanna Burton, with contributions by Mel Bochner, James Meyer, and James Rondeau. This has been a much anticipated catalog, since Bochner is best known for his work with numbers as a conceptual artist, yet he was also one of the first artists to introduce language into the visual field in the 1960s. Despite their significance, these contributions remain unexplored in art-historical scholarship. Highlighted in this volume are over 60 works in a wide range of media bringing together for the first time an overview of the artist’s language-based works from the past 40 years., including many previously unpublished images and projects. Highlights include the landmark piece Working Drawings and Other Visible Things on Paper Not Necessarily meant to be Viewed as Art (1966), which art historian Benjamin Buchloh called “the first conceptual art installation.” Also featured are Bochner’s series of magazine interventions published between 1966 and 1968; a number of early word portraits of Bochner’s contemporaries including artists Dan Flavin, Eva Hesse, and Donald Judd; and new photography of Bochner’s seminal installations: Theory of Boudnaries (1970) and Axiom of Indifference (1973), which the artist re-created at the Art Institute of Chicago in 2006. Radio Territories, edited by Erik Granly Jensen and Brandon LaBelle (Los Angeles/Copenhagen, ErrantBodies Press, 2007, $25.00 paper) involves the legacy of radio and the arts which spawned forms of radical culture, from early Modernist notions of the “Wireless Imagination” and its subsequent vernacular tongues to Acoustic Ecology’s call for “Radical Radio” based on removing the DJ, transmission and broadcast media upsets and redistributes understandings of place, corporeality, social exchange, and the politics of information. Radio streaming seeks to counter or supplement forms of public broadcasting through creating unique forms of collectivity. Critical and creative essays by historians, media theorists, and radio producers, icnluding Steve Goodman, Heidi Grundmann, Douglas Kahn, Mikkel Bolt Rasmussen, and Ellen Waterman, are coupled with artist and activist projects, from such practitioners as Anna Friz, LIGNA, and apo33, with a view toward locating the expanidng and deepening reach of radio. This book aims to examine in what ways physical and cultural geographies become both defined and unsettled by the powers of broadcast. Current radio seems to fulfill Marshall McLuhan’s global idea of the “extended nervous system” by networking individual lives on a cellular level. The list of contributors is long, amplilfied by a CD and audio works by apo33, Joe Banks, Steve Bradley, John Hudak & Joe Resinsel, elpueblodechina, Anna Friz, Jason Kahn, Kode9, Kristen Roos/Jackson 2Bears, SRC, Ellen Waterman, and James Sey/James Webb. CD notes, Biographies, Index. Distributed by D.A.P. The Best Surprise is No Surprise with an introduction by Daniel Birnbaum, edited by Anton Vidokle, and an interview by Hans-Ulrich Obrist (e-flux/J.P. Ringier, 2006, $39.95 paper) uses an archive of electronic announcements distributed by e-flux, documenting significant recent developments in art-related media releases, which are now global, instantaneous and linked coming and going. Readers can track dissemination of information about exhibitions, publications, events and symposia organized and selected by some of the most active international curators, artists, critics and art historians of our time. The information is accompanied by brilliant color images of the events themselves, so that the book becomes a resource documenting recent contemporary exhibitions as well as the evolution of their self-portrayal and promotion. Amazing that although e-flux did not archive their announcements before 2002, many “readers” had huge e-flux archives and submitted them to e-flux to flesh out this volume. This brings to mind why presskits are also documentation that might get lost if not retained in some way. As a result, this volume traces the events, the curators, the artists, and the vital art scene which is our legacy. Peter Greenaway: Fort Asperen Ark, edited by Peter Greenaway, is a telling of Noah’s Ark through a series of unadulterated abstract drawings. The uncoated paper, the exposed coptic-stitched spine and a circular die-cut hole that runs through the book from cover to cover makes this more an artist’s book rather than a “catalog” of an exhibition. Published by Veenman Publishers, Rotterdam, 2006, $32.00 softbound Truly a beautiful production in “92 days”. Immersion/Immersive: Carolee Schneemann, Caroline Lathan-Stiefel, Michelle Gay, Demian Petryshyn, Luis Jacob with texts by Susie Major and Randall Anderson (Montreal, Articule, 2006, price unknown) is the result of a call for proposals to see artists who explore the nature and utility of “immersive” as cultural terminology. The artists chosen each explore aspects of the immersive in their work. Carolee Schneemann’s exhibition which seems so current was the catalyst for this study, since her work embodied the kind of total engagement that contemporary purveyors of new media promise–and most of her work of Meat Joy happened in 1965. Curated by Marcus Miller, the exhibition and now its bilingual catalog increase interest with ample color images, and biographical notes. Marc Camille Chaimowicz: Celebration? Realife by Tom Holert (London, Afterall Books, 2007, $16.00 paper) is another in this series of books based on one work of an artist considered in detail by a single author in order to understand art in general. Chaimowicz was one of the first artists to merge the realms of performance and installation art. He distinguished himself in an era of stark minimalism by his unabashed pursuit of the beautiful, establishing himself in the 1970s with art that was playful and subtly seductive. His post-Pop environments owed as much to glam rock as to art practice and were informed by modern French literature as well as by art theory. Celebration? Realife featured masks, mirrors, various small objects (including a pair of orange knickers and a white bra), a glitter ball, music by the Rolling Stones, David Bowie, and others–and the artist, serving tea and engaging visitors in conversation in an adjacent room. The questions raised by this work included public/private dichotomies, art/design boundaries, and identifications based on gender, and recast the artist as a kind of art director and stage designer. The work was reinstalled in 2000 to critical acclaim, confirming Chaimowicz’s importance and points to his relationships with artists as different and as difficult as Cerith Wyn Evans, Jutta Koether, Kai Althoff, and others. Includes 32 illustrations in color and black and white which helps us reconstruct that cultural moment in the 1970s when the role of the artist and relationships of art, design, popular culture, and performance changed. Holert shows how this influential work inventively anticipates and helps to define an important and increasingly popular tendency in art. Mary Heilman: Save the Last Dance for Me by Terry R. Myers (London, Afterall Books, 2007, $16.00 paper) presents Heilmann as one of the most important abstract painters of her generation, combining the modes of Abstract Expressionism with a vibrant pop sensibility. Her painting,, Save the Last Dance for Me, done in 1979 in hot pink and black, marked a shift in Heilmann’s perspective. As she says: “Now the work came from a different place. Instead of working out of modernist non-image formalism, I began to see that the choices in the work depended more on content for their meaning.” Here she shows her personal expression of sorrow and joy together to create an important and influential work, within painting and beyond. Now that her retrospective has opened in Orange County in California and will travel through 2007 and end at the New Museum of Contemporary Art in 2008 in New York City, this book is quite appropriate. Wittgenstein, Ludwig: Remarks on Colour (Berkeley, Univ. of California Press, 2007, $16.95 paper) comprises material on color which was written by Wittgenstein in the last eighteen months of his life. It is one of the few documents which shows him focused at work on a single philosophical issue. The principal theme is the features of different colors, of different kinds of color (metallic color, the colors of flames, etc.) and of luminosity–a theme which Wittgenstein treats in such a way as to destroy the traditional idea that color is a simple and logically uniform kind of thing. This edition consists of Wittgenstein’s basic German text, together with an English translation. Wittgenstein, Ludwig. Zettel, ed. by G.E.M. Anscombe and G.H. von Wright (Berkeley, Univ. of California Press, 2007, $19.95 paper) Zettel, an bilingual edition, collects fragments from Wittgenstein’s work between 1929 and 1948 on issues of the mind, mathematics, and language. The fragments were left in a box-file, for the most part cut from extensive typescripts of his, other copies of which still exist. Some were in transcripts, others in manuscript. The editors have traced most fragments to their sources, seeing that Wittgenstein had worked on these fragments in order to stimulate the reader, providing also frustration in his explorations into issues of mind, mathematics, and language. Wittgenstein, Ludwig. Lectures and Conversations: On aesthetics, psychology and religious belief, ed. By Cyril Barrett (Berkeley, Univ. of California Press, 2007, $14.95 paper) In 1938 Wittgenstein delivered a short course of lectures on aesthetics to a small group of students at Cambridge. The present volume has been compiled from notes taken down at the time by three of the students: Rush Rhees, Yorick Smythies, and James Taylor. They have been supplemented by notes of conversations on Freud (to whom reference was made in the course on aesthetics) between Wittgenstein and Rush Rhees, and by notes of some lectures on religious belief. As very little is known of Wittgenstein’s views on these subjects from his published works, these notes should be of considerable interest to students of contemporary philosophy. Further, their fresh and informal style should recommend Wittgenstein to those who find his Tractatus and Philosophical Investigations a little formidable. Complete Minimal Poems by Aram Saroyan (Brooklyn, Ugly Duckling Presse, 2007, $20.00 softbound) returns to press after decades of creating a buzz, but non-inaccessible books. Their re-emergence is celebrated by the likes of Kenneth Goldsmith and Vito Acconci. Saroyan is a poet’s poet-and these groundbreaking concrete and minimalist poems of the 1960s are gathered together here in a single-much-needed volume. Anticipating the Language poets, e-poetry and web aesthetics, and the influences on conceptual writers in general, These sometimes one-word poems, visual poems, concrete poems, and short poems, electric poems are now available for study, perusal and understanding. This poetry breathes, sparkles and illuminates. The Bone and Bird Art of Joyce Cutler-Shaw and Sarah Perry, curated by Max F. Schulz was a show at USC Fisher Gallery from 14 February - 14 April 2007. Putting these two artists together was a dream show, because their affinities they share were appreciated by the curator. From the “Alphabet of Bones” of Cutler-Shaw to Perry’s “Bone Dust”, there is a serious side of their art mingled with a sense of humor, a pervasive appreciation of natural phenomena, and an enduring and abiding faith in humanity. They both deal in small items which are given such monumental status by the artists that one can marvel at the prowess in which they execute their talents. This exhibition examines the work of two Southern California artists using bones as the subject matter or the medium of their art. Cutler-Shaw has been exploring both clinically and imaginatively the moving, yet natural, phenomenon of death’s transubstantiation of a human organism into an articulated skeletal phantom of one’s essential self. Sarah Perry combs the California deserts to harvest the bones of animals, rodents, reptiles, and owl regurgitations of bone pellets, which she translated into skillfully engineered sculptures of earthly/galactic references. Order from USC Fisher Gallery, University of Southern California, University Park, Los Angeles, CA 90089-0292. $10.00 plus $2.00 postage. WACK! Art and the Feminist Revolution, organized by Cornella Butler and Lisa Gabrielle Mark (Los Angeles, MOCA and MIT Press, 2007, $59.95 cloth) is a big (512 pages) catalog with 475 color illustrations of a traveling show which tries to prove that documents the impact of the feminist revolution on art made between 1965 and 1980, featuring pioneering and influential works by artists who came of age during that period. But if we are to honor Judy Chicago’s Dinner Table to Cindy Sherman’s Heroines to Yoko Ono’s Cut Piece, why did they ever choose a cover of prone female bodies collaged over the cover–what a shame that “body art” was used to attract the buyer? or tell us how much the body was used in this art, or was the cover used to titillate the viewer? Anyway, Martha Rosler does better than this cover and its original meaning. As for the catalog and the exhibition, the organizers make a new and bold claim: that feminism was not only a political movement, but the last great art movement of the 20th century and is as important as the other iconic “isms” of the 20th century (Impressionism, Futurism, Minimalism, Dadaism). The organizers maintain that this group of artistic visionaries and activists exercised a power and influence that profoundly changed contemporary art. To prove this the curators feel this show brings a counter-cultural phenomenon to the mainstream, aided by a network of mostly but not exclusively female historians, critics, and curators who gave intellectual and critical traction to their sisters’ practice. After 207 pages, the biographies appear, then a chronology through cartography: Mapping 1970s Feminist Art Globally. Essays by Marsha Meskimmon, Abigail Solomon-Godeau, Peggy Phelan, Richard Meyer, Judith Russi Kirshner, Valerie Smith, Nelly Richard, Helen Molesworth, Catherine Lord and Jenni Sorkin flesh out the period from all points of view. Completing the hefty catalog is a Selected Chronology of All-Women Group Exhibitions, 1943-1983 and a checklist of the exhibition. Mudman: The Odyssey of Kim Jones, edited by Sandra Q. Firmin and Julie Joyce, with essays by Sandra Q. Firmin, Julie Joyce, Kristine Stiles, and Robert Storr (Cambridge, MA, MIT Press, 2007, $19.95 paper) is the first comprehensive survey of Kim Jones’s performances, installations, and drawings from the 1970s to the present. It certainly has been an odyssey, a steadfast one, in which the Mudman, caked in mud, bearing a lattice appendage of sticks attached to his back, wearing a headdress and a nylon mask, began to appear on city streets, on the beach, and in galleries around Southern California in the 1970s. Emerging from the performance art movement as the unsettling, itinerant figure of Mudman, Jones connected the abstract, formal investigations of process–and material-based artists– with the intense physicality of body-based performances. Jones dressed himself as the Mudman as an artistic persona, but also as a walking sculpture, part shaman, part urban cult figure, becoming a powerful icon for an era in some ways defined by the Vietnam War and a fascination with alternative lifestyles and non-Western religious practices. Jones stood in front of my artist book shop, Artworks, in 1979 and stayed for the six hours we were open–an icon, a shaman, a mystery. More recently, Jones, now living and working in New York City, has become known especially for his War Drawings, exhaustively detailed pencil and erasure drawings in which x-men and dot-men endlessly engage and disengage. Yet the saga that has been his life, and his art, is a very good read. This catalog is probably more readable than most–and you get to know Kim Jones so much better. An illustrated chronology of his exhibitions, bibliography and checklist completes this fascinating, even remarkable career of Kim Jones. Lakich: For Light, For Love, For Life with text by Lili Lakich, with contributions by Louise Lewis, Michael Several, and Ray Zone (Los Angeles, Lilie Lakich Studio, 2007, $45.00 hardcover) is not a catalog per se, nor is it an autiobiography, nor is it an artist book, but a mélange of all of the above. 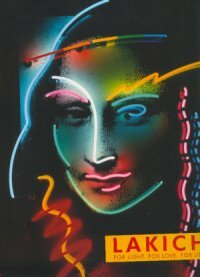 Self-published, this book contains the life and art of Lili Lakich, a force in Los Angeles who founded the Museum of Neon Art in Los Angeles, but is also well-known for her amazing neon works either commissioned or just expressions of the time, the place and the phase of an artist’s life. Her work is dynamic, glowing and phenomenal–and this book is a collaboration or even a dialogue of her work with others and herself. Each piece is commented upon by a critic, but also commented upon by Lili herself. Her life has been light-induced, her medium neon–and the book is a witness to an artist’s life and creativity combining to make that life. Her work covers portraits, sacred icons, art icons (Mona is her famous symbol), AIDS series, sirens, self-portraits with bombs, public, corporate & residential commissions, and exhibitions. Cabinet 25: Insects, edited by Sina Najafi, with texts by such writers as George Pendle, Margaret Wertheim, Steven Connor, Frances richard, Sandy Zipp, Louis Kaplan, and Joshua Glenn. (Cabinet, illustrated throughout, $10.00 dist. by D.A.P.) Although there are estimated to be 10 quintillion individual insects alive on the earth, counting for more than 80 per cent of the world’s total species, our knowledge about their true character and extent is full of holes. Included are interviews with Edward Thacker on swarming and with Deborah Gordon on colony organization, Haldane on why insects are small, George Pendle on Virgil’s elaborate funeral for his pet house fly, Margaret Wertheim on insect vision, a minor history of Miniature Writing by Joshua Foer, brief excerpts by artists from The Museum of Modern Art Artists’ Bookbook including words of Louise Bourgeois, the Christos, Salvador Dali, de Kooning, Warhol and others and remarkable illustrations by Cornelia Hesse-Honegger.